At Dream Occasions are always enhanced from the flamboyant and opulence, to the stylish and minimalist of floral displays. Our clientele ranges from individuals looking to wow a few friends at an intimate gathering, to people arranging lavish weddings or large corporate gatherings. Whether you’re looking for something traditional or trendy, bold or bashful, whimsical or wild at heart, we’ll work with you to express the joy of the occasion through our unique-to-your floral designs. Only the best quality flowers are used within our arrangements at Dream Occasions. The flowers are handpicked by our expert team or ordered from specialist farms & wholesalers to ensure the client’s expectations are truly exceeded. Our Designers enjoy working with both contemporary and classical styles to create arrangements to compliment you and your theme. In every instance, we tailor our floral and event designs to fit your specific needs and budget. 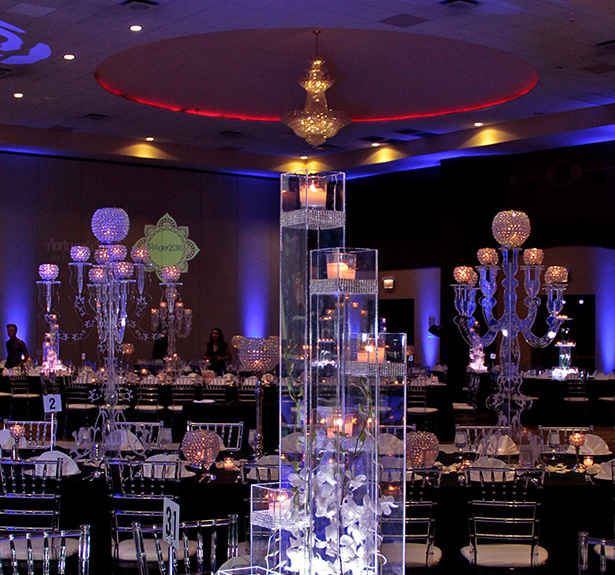 Lighting along with Draping dramatically changes the vision of your event space. To change the color or the appearance of drab, ugly walls…draping with lighting has an immediate impact on the ambiance of the space. Our Exclusive Draping comes in a variety of custom colors ranging from sizes up to 25 feet high. Our Exclusive Signature Starlight Backdrop, provides a stunning backdrop as the minuscule points of changing lights flash or simply stay static. Why not upgrade your dance floor to give you that clean gloss white look, or have a Starlight Dancefloor. Or even an Exclusive Interactive Dance Floor paired with intelligent lighting. It’s apparent that decorative Lighting & Draping will solve most problems clients have with many spaces, thus transforming the space into your desired look.